Have you ever wondered about scuba diving but hesitate to take certification and want to “try dive” first? This program is the answer for you to discover excitement and adventure of your first time breathing underwater. No experience required seeing the spectacular underwater world with our qualified instructors, and diving masters. This program is ideal for those that do not have enough time for a certified course, or just want to experience Scuba for the first time in a safe professional environment. 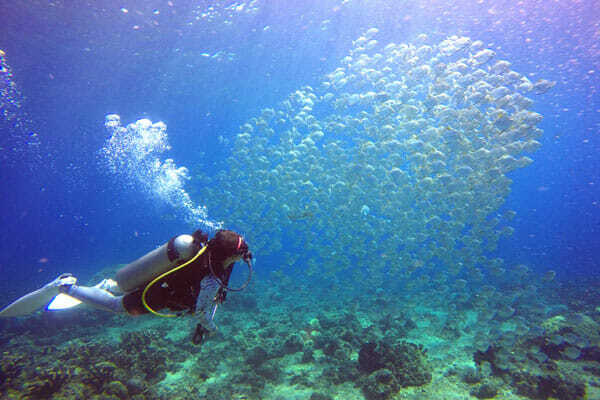 A full day program or half day, 2x dives in a day, depend on which Bali Dive Site area you choose. Highlights of Bali Diving area, such as Tulamben, Padang Bay, Amed located on the east side of Bali, and suitable for beginners divers. Our Instructor will explain and conduct some basic skill before going to the open water. Program will be conducted at the pool or confined water "pool like condition at the shallow water" . All the way from descending to start your Scuba Diving underwater, your instructor will be at your side until you are surfacing, ratio in close grouping with max of 2 divers and 1 instructor. This program is 2 dives program within 1 day. Once you complete this program if you want to be able to dive anywhere and anytime around the world, you will want to check out about taking full certification program - the Open Water Diver Course for 3 days only. Otherwise, you can also choose half certification for Scuba Diver Course for 2 days only to be a certified diver who has limited holiday time in Bali. Choosing the right diving facility for your Bali scuba diving course in your vacation here while for the first time holiday and scuba dive in Bali or even the first time for you to breathe or in a Bali dive course program are not easy to find.Your fun and safe adventure begin with a good quality diving course and Bali dive school or Bali dive course operator. With BFD - Bali Fun Diving has certified and qualified PADI and SSI Scuba Diving Instructors, highly recommended of dive master, dive guide, and instructors. All are friendly, passionate, fully equipped with skills and their competency is important, well-trained Instructor, they're experienced and dive professional who will ensure that you have fun.Let's start your scuba diving in Bali while we are showing you exotic underwater panorama with safety and the right techniques.